Some days one wakes up with such a degree of clarity… knowing that idiocy is one’s natural state. Remember when I went out to check all my WiPs and UFOs, to see what might be completed in time for the Show this year? I found very little. Well, I should like to know why somebody (yes, me) failed to spot that I had a sweater part-way done that requires only 4 or 5 days knitting to complete it. Section V, Class 95: Jumper, any size, any pattern/colour. My Warriston could have been in there if only I had put 2 and 2 together. I am, as I say, an idiot. Other classes that I failed to notice and could have entered were the Bread Rolls in the Baking Section. I mean… I actually made a batch anyway! And then there was the Felted Item class in the Handicrafts section. 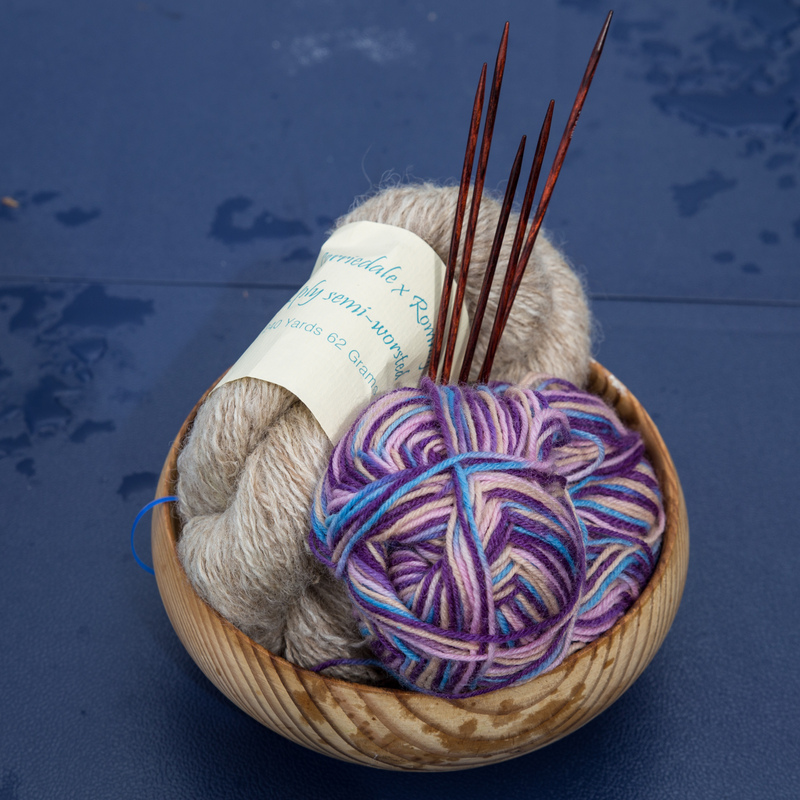 I did actually knit a bowl. It is sitting around awaiting a couple of trips through the washing machine when I have jeans or towels to wash. I just did not realise that Felting had returned to the Schedule! Really, I do need to be better organised in the coming twelve months. Or less of an idiot. Or both. You know what this means, don’t you? I shall have to revisit the UFO Completion Plan. ARGH. One day I shall have whipped matters into shape. One day. Not any time soon. I must keep away from The New and The Exciting. My immediate knitting plan, to be effected while I am thinking out the longer term plan, is to complete the Pavinated Curl first and then to get that Warriston done. I want to be wearing the Warriston this winter. It has reached the armholes and is ready for the sleeves. After that I hope to return to the Windswept shawl and complete it. Alongside these projects I shall be tinking the yellow doily. The longer term plan of UFO completion will have space in it for a handful of small and readily-completed new projects that will stave off any boredom and also fill in the Schedule next year. The big question is, how will my hands hold out. I cannot imagine that I shall ever regain any real levels of productivity. It is a Sanday Soulka weekend. Mr L has gone out to play trains. Later on we hope to go and see the Lifeboat and perhaps take our cameras. Speaking of cameras… it’s time to get back on to that diet wagon. Oh, yes, indeedy. But not today. Today is for pasta and fresh scallops and a creamy white wine sauce and a bottle of Pouilly-Fumé. There will be salad. That cancels out the cream, doesn’t it? Today is Yorkshire Day. I have my metaphorical white rose on. I am now going out to the van to inspect the state of my sock yarn leftovers. I shall be taking the kitchen scales with me and will be making a small plan.